A group of fifth-graders welcomed Fenves and his wife Carmel with big smiles and quickly escorted them to the library. After introducing their special guests to the librarian, the students shared stories from their favorite books. After the library tour, President and Mrs. Fenves took a trip to the cafeteria and met the in-house chef who prepares healthy food—including vegetables grown from their school garden. 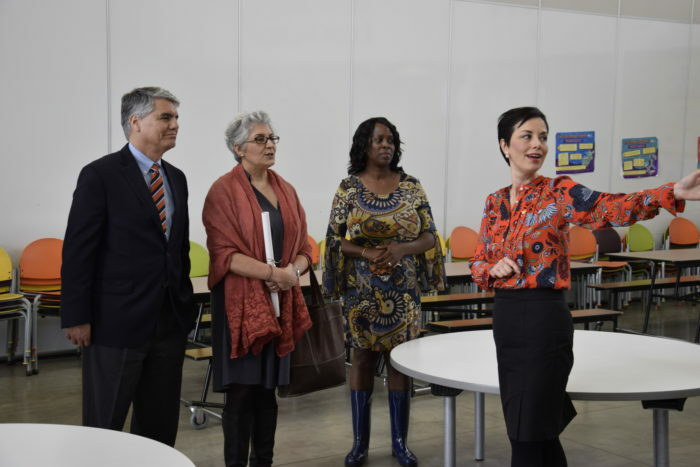 They talked with Superintendent Dr. Melissa Chavez (pictured on the right) and Principal Tonya King (pictured in the center) about the school’s focus on SEL (social and emotional learning) and RTI (response to intervention) amidst the sounds of string instruments as the Little Longhorn Orchestra rehearsed on stage. 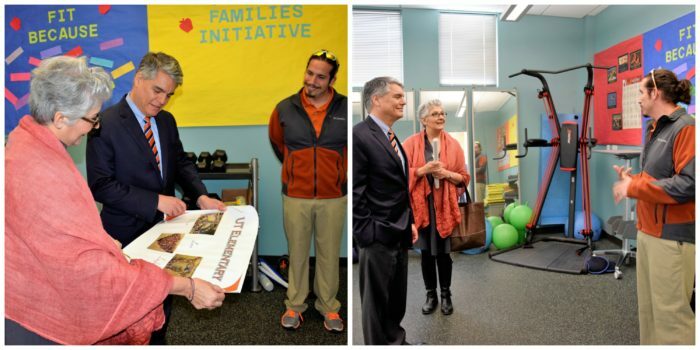 Bob Knipe (known as Coach K) presented the Fenves’ with a handmade greeting card and gave them a quick tour of the exercise room, where students learn the value of healthy living at a young age. On their way to the row of portable classrooms, the Fenves’ stopped at the school garden and visited with Wellness Teacher Rebecca Vore. A stark contrast to the gloomy weather, the classrooms were filled with colorful artwork and shouts of excitement. Upon their arrival, the Fenves’ were presented with a giant thank you card from a class of admiring students. 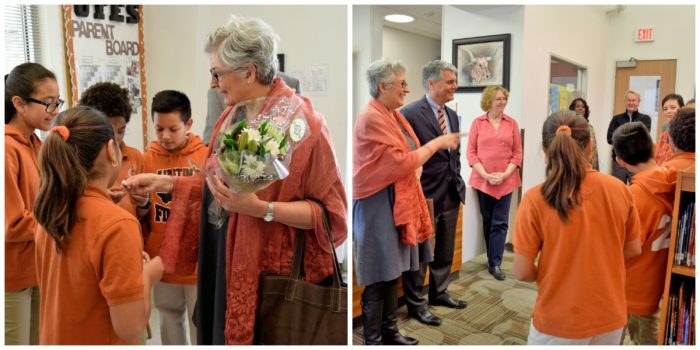 In the adjacent classroom, students took a break from their art projects (handmade placemats for the big UTES fundraiser) to greet the leader of the “Big UT,” a school where many of them plan on attending after high school graduation. 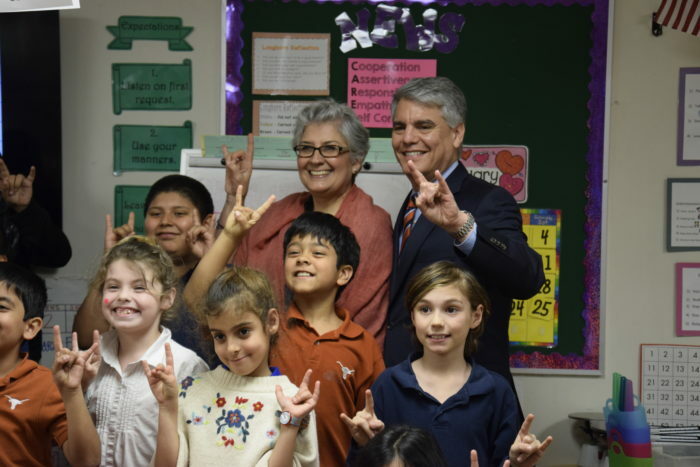 On his way out, Fenves was given the hero’s welcome by some of the school’s littlelest Longhorns. 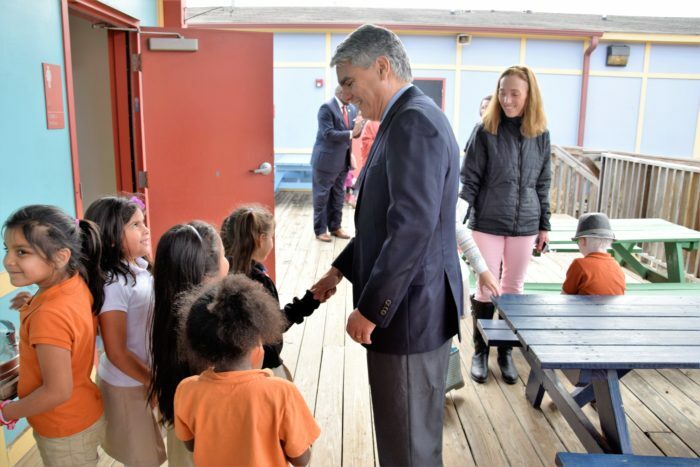 They were all smiles and giggles as they waited patiently to shake hands with Fenves. 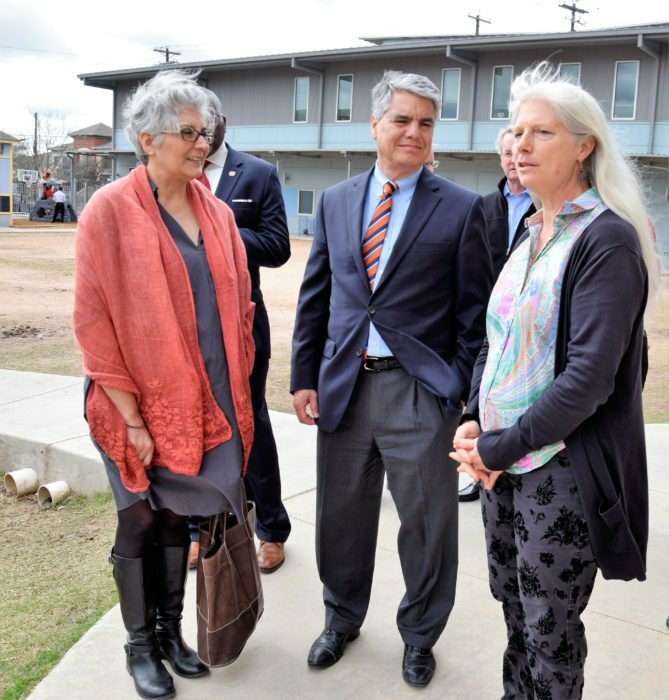 More about UT Elementary: A unit within the Division of Diversity and Community Engagement, UTES is a public charter school that serves urban children and serves as a research-based demonstration school. Founded in 2003, UTES is operated by UT Austin as an open-enrollment campus, free to students, with a lottery-based admission system. Read this story in Access & Excellence, the magazine of the DDCE, to learn more.